Instantly Access your Validated Cloud-based Calibration Program from Anywhere! Thousands of Clients... Large & Small! 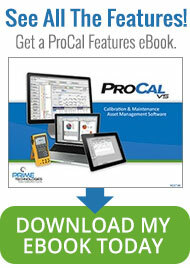 Major regulated industries across the globe use ProCalV5 Calibration Management Software. Prime Technologies offers proven calibration management software (CMS) solutions to manage assets for Calibration, Maintenance and Validation. A ProCal system ensures regulatory compliance, improved practices, saves time, increases productivity and reduces operational costs. Paperless Real-time Solutions: ProCalV5 delivers the management benefits, performance advantages and reporting efficiencies only available with a truly full functioning paperless solution. Our mature robust program will perform with reliability experienced only with the very best software systems. Compliance: ProCalV5 has been specifically designed to provide the features necessary to satisfy the strictest of compliance requirements. These comprehensive control features support the compliant record management dictated for cGxP operations per 21 CFR Part 11, ISO 9000-2001, QS 9000, ISO 17025, ANSI 254, AS9100 and others. With ProCalV5, record access is configurable yet restricted to authorized users. The complete and easily queried Audit Trail confirms record integrity. Hybrid Solutions: Not ready to move to a paperless environment? With ProCalV5 you decide the extent of your continued use of hard copy worksheets, forms and reports. 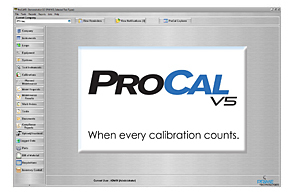 When you select ProCalV5 as your Calibration Management Software, you decide how to run your operations and configure the program to suit your practices, not the other way around. Standalone Solutions: Not looking for a comprehensive management system throughout the entire facility? No problem! ProCalV5 can easily be used as a standalone application and may be easily deployed in the future as ProCalV5 comes network ready. Single Site Solutions: ProCalV5 users benefit from not having to invest in licenses for every unique user which can quickly add up. ProCalV5 operates by concurrent system access. That means you can make ProCalV5 available to as many users and define their roles and each user may have ProCalV5 running on their personal workstation. 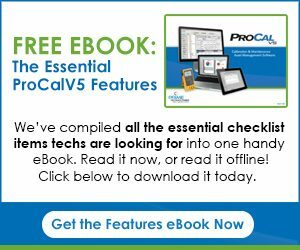 Multi-Site Solutions: With ProCalV5’s robust proven two-tier installation, organizations receive a high degree of customization, work saving options and tools for real time paperless field calibrations. ProCalV5’s unmatched functionality offers all the benefits of a single site system while retaining the ability to customize the application for local requirements and end uses alike. Through the use of Citrix or MS Terminal Server Thin-client environments, ProCalV5 may also be deployed. This can help save on implementation and validation costs, while user distribution is simplified without compromising performance or reliability. ProCalV5 delivers unmatched functionality. From the beginning our mission has been to develop and through continuous improvement maintain for our users a software product far superior to anything else in the market. Whether your needs include a truly paperless compliant real time calibration management and reporting solution or simply a management system that can be validated to satisfy the requirements of 21 CFR Part 11, ProCalV5 is the right choice. Its versatile design, and scalability make it the right system for the small business or large corporate enterprise. Do You Have Straightforward Calibration Management Needs? Do You Currently Outsource Your Calibrations? 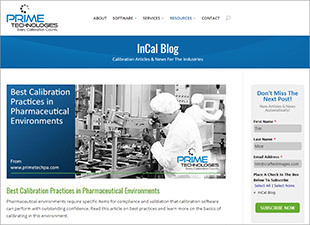 Visit the InCal Blog for Articles and News about Industry News and ProCalV5. AstraZeneca Now Live with ProCal SAP Interface! ProCalV5 Selected by Many Companies Around the Globe to Replace Honeywell Documint Programs! Shell Upgrades Many Safety and Environmental Reporting Practices With ProCalV5! ProCalV5 is Selected for Use at Many Nuclear Regulated Facilities! Prime Technologies Software is Used at Over One Hundred Power Generating Locations. ProCal Direct Now Offered as a Cloud Based SaaS (Software as a Service) Option! Many New Precision Test Modules Have Been Added as Options to ProCalV5! Global Implementation Process: Prime Technologies ProCalV5 Praxair selected Prime Technologies to implement the ProCal instrument calibration software in all global production facilities. The Prime Technologies team has exceeded expectations supporting Praxair in design, configuration, training and validation of the solution. Great response by all Prime team members, excellent demonstrated customer service with response, professionalism which has resulted in a project which is on schedule/on budget and most importantly meets our expected results. This project will run through 2015 and we have no concerns with completion and it fully meets our global customer requirements.